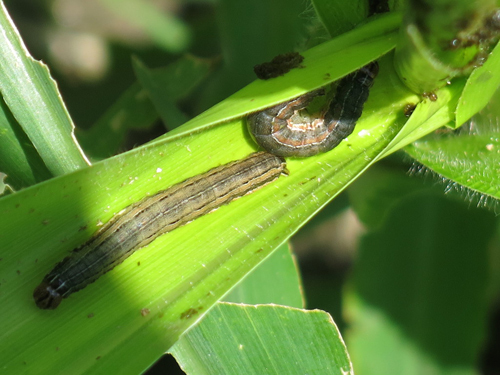 All the Extension officers and ARDCs are advised to carry out regular monitoring of the armyworm particularly in paddy nurseries and maize fields to implement control measures on time. Where and when is it a problem? The early arrival of warm dry weather followed by rain in spring is favorable for reproduction and multiplication of armyworms. Local impacts can occur every year, but significant damage only occurs when there are severe outbreaks. Such outbreaks, when large numbers of larvae move from field to field voraciously feeding on foliage, can occur every several years but are typically quite localized. They are difficult to predict. Armyworms can cause heavy losses to rice nurseries, with caterpillars destroying seedlings. They also attack rice and maize fields and, to a lesser extent, barley and buckwheat. Considerable losses in rice seed can result from larvae cutting of the panicles. They are readily managed provided infestations are detected early enough. If you detect armyworm outbreaks in your locality, please contact National Plant Protection Center at phone number: 02351016 or email at nppcsemtokha@gmail.com.